people have made an effort to breed these POK�MON. 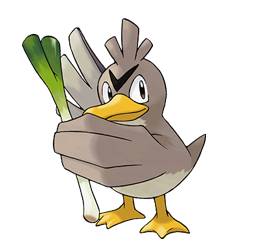 Ruby/Sapphire FARFETCH�D is always seen with a stick from a plant of some sort. Apparently, there are good sticks and bad sticks. This POK�MON has been known to fight with others over sticks. Emerald It is always seen with a stick from a plant. Apparently, there are good sticks and bad sticks. This POK�MON occasionally fights with others over choice sticks. Leaf Green The plant stalk it holds is its weapon. The stalk is used like a sword to cut all sorts of things. Diamond/Pearl It can�t live without the stalk it holds. That�s why it defends the stalk from attackers with its life. Platinum It can�t live without the stalk it holds. That�s why it defends the stalk from attackers with its life. Heart Gold If anyone tries to disturb where the essential plant stalks grow, it uses its own stalk to thwart them. Soul Silver If it eats the plant stalk it carries as emergency rations, it runs off in search of a new stalk. Black It can't live without the stalk it holds. That's why it defends the stalk from attackers with its life. White It can't live without the stalk it holds. That's why it defends the stalk from attackers with its life.